The King's Ginger was specifically formulated by Berry Bros. & Rudd in 1903 for King Edward VII. King Edward VII literally lived life in the fast lane. He would endlessly drive his horseless carriage (a Daimler), whatever the weather. So much so, that in 1903 the Royal Physician became concerned about the monarch’s health. So, he called on Berry Bros. and Rudd for a solution, a high strength liqueur that would warm and revivify His Majesty. Crafted from fresh ginger, (for centuries celebrated for its medicinal properties) and enlivened by the judicious addition of citrus oil, The King’s Ginger was born. Rich, golden and delightfully crisp in flavour, it helped King Edward stay colourful and ready for whatever came next. While wonderfully uplifting and enjoyable on its own, The King’s Ginger comes to life in social situations (just as King Edward did). It is the perfect foundation for any occasion, including these delicious cocktails: King’s and Tonic, The King’s Fizz, The King’s Mulled Cider, The King’s Summer Cup. 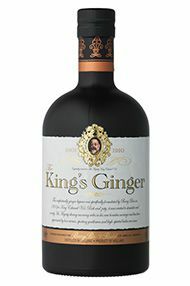 A liqueur fit for a King- It's not new indeed it's been knocking around since 1903 when it was created by Berry Bros & Rudd for King Edward VII to warm him up on wintry drives but we think it’s time to shout about King's Ginger Liqueur, which has just had a spruce up for the 21st century. This splendidly pokey liqueur is packed with spicy dried and raw root ginger flavours and a robust 41% abv hit, which make it a great addition to long drinks such as Mojito and Mules, and in warming nips like Rusty Nail/Whisky Mac style drinks Oh and you can also tip it over ice cream, pair it with chocolate and sip it neat Classy, versatile and authentic we think it deserves to be the next St Germain. Festive Tipple. No Christmas is complete without a bottle of something special to sip. The wine merchant Berry Bros created The King's Ginger liqueur in 1903 specially for King Edward VII, to stimulate and revivify His Majesty. With its delectable taste derived from macerated ginger root and lemon peel, the tipple remains a winter favourite. The appearance is seductively golden. On the nose an instantly warming aroma of ginger, zesty lemon, sherbet and golden syrup leads to an initial sweetness on the palate that is followed by bite of ginger and lemon notes. The mouth feel is deliciously satisfying and warming and the finish is lingering and extremely long. 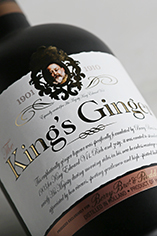 The King’s Ginger is a liqueur which was specifically formulated by Berry Bros. & Rudd in 1903 for King Edward VII. Rich and zesty, it was created to stimulate and revivify His Majesty and has been appreciated by bon viveurs ever since. A fiery ginger spirit enlivened by a hit of zesty lemon, this is best enjoyed both on its own or in cocktails. Created especially for His Majesty King Edward VII as he engaged in his winter sporting pursuits, The King’s Ginger liqueur has an unmistakable and utterly delectable taste of firey root ginger and zesty lemon peel. 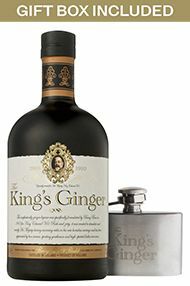 Displayed in an attractive presentation box, this gift pack contains one 50cl bottle of King's Ginger and a 1.5oz mini hip flask, the perfect size to keep a supply of King's Ginger at hand during outdoor pursuits.